Hello, my friends! As I promised you yesterday, today I am here to offer you a horse of a different color! "A topic or a plan that represents a change from what one thought was being talked about or considered. Shakespeare offered the companion saying in “Twelfth Night,” where Maria is offered a comment on her plans against Malvolio and responds: “My purpose is, indeed, a horse of that colour.” In 1798 the Philadelphia “Aurora” had a line on President John Adams, to whom the paper referred sarcastically as King John I: “Whether any of them may be induced to enter into the pay of King John I is ‘a horse of another color.’ One suspects that the image originated in racing where one might have bet on a horse of a certain color only to find that a horse of another color is winning." From "The Dictionary of Clichés" by James Rogers (Ballantine Books, New York, 1985). 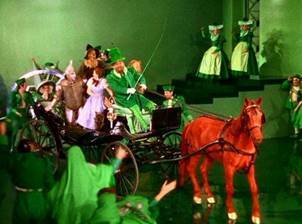 "When Dorothy, the Tin Man, the Scarecrow, and the Lion arrive at the Emerald City, they are met by a carriage pulled by a most unusual horse. On the way to the Wizard’s secret chambers, it changes color before everyone’s eyes. 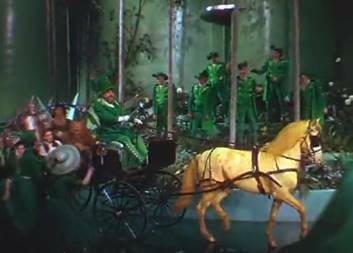 How did they change the color of the horse in the "horse of a different color" scene? 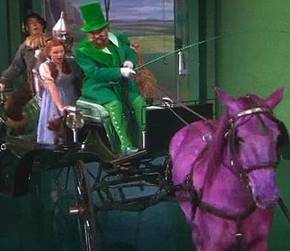 At first, the film’s creative team thought the horse could be painted to create the multi-hued illusion, but the American Society for the Prevention of Cruelty to Animals said no. The trick was to find a substance that would not only pass the ASPCA test but would photograph clearly. Food coloring was tried, even liquid candy, both without success. The colors were too tame, and much too tasty. Finally, a paste of Jell-O powder was found acceptable. The horse continued to lick but, with frequent touch-ups, the problem was solved."